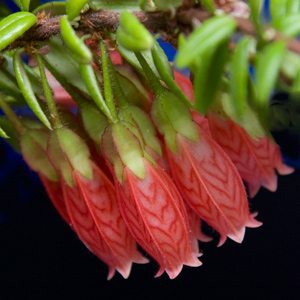 Agapetes serpens are a rare evergreen shrub native to China and South East Asia. Agapetes prefer a humus rich moist but well drained soil and part shade. Agapetes serpens (see picture right) is known as the ‘Himalayan Lantern’ and with attractive bright red flowers on arching stems can be used in a hanging basket, container grown or even trained as a weeping standard plant. Drought tolerant and very attractive to nectar loving birds. Preferring a slightly acidic soil the flowers in winter are appreciated in many gardens. .
With its weeping habit you can grow these colorful plants in a hanging basket or a container or with a little work turn it into an interesting standard. A wonderful aspect are the pretty pretty pale mauve berries that form after the flowers, looking like glistening pearls they are an attractive addition. The thickened base of Agapetes serpens x rugosum forms a textured caudex over time, another feature. Agapetes serpens ‘nepal cream’ is a cultivar with pretty cream flowers, as far as we know not available in Australia at present. Little to no pruning is required, a humus rich moist well drained soil with a little shelter from hot sun and drying winds. Mulch well and water in dry periods. Propagation is from seed or cuttings. Agapetes plus Orchids, Including: Australian Native Orchids, Dendrobium, Cymbidium, Paphiopedilium and others. Also Ferns, Bromeliads, Hoyas, Vireyas, Clivias, Tillandsia, Carnivorous Plants, Tassel Ferns.